One of my favorite iPad apps, Book Creator has been released for Android. You can make your own digital book by adding any combination of text, images, videos, and drawings on each page of your creation. On iPad the book can be exported to iBooks. You can copy the book into Google Play Books on Android. Unfortunately, Google Play Books currently does not support audio or video. Hopefully that is coming soon. For the most part, when a developer releases the same app on both platforms, the apps have identical features, menus, and icons. It still seems true that there are more educational apps are on iPad, but a growing number are also becoming available for Android. Using the same apps can help in classrooms that embrace Bring Your Own Device (BYOD) / Bring Your Own Technology (BYOT). Having a common set of apps can certainly simplify things and provide more opporunties for collaboration. 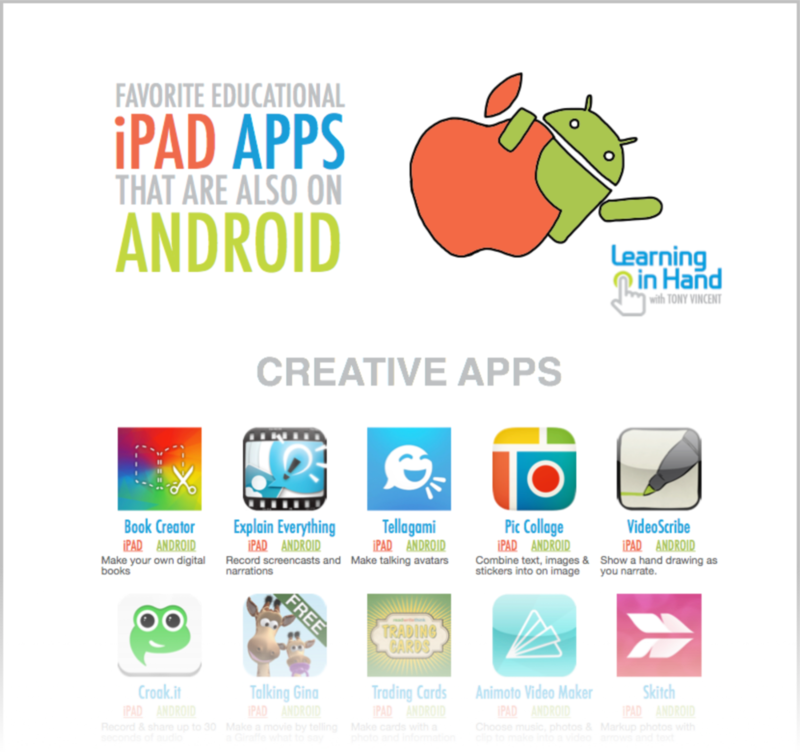 I’m maintaing a list of favorite educational apps that are available for iPad and for Android. You can click the image below to view the PDF. Each app has direct hyperlinks to both Apple's App Store and Google's Play Store. You’ll see that I have sorted the apps into 6 groups: creative, utility, study, classroom, and reading/social apps. There are some notable iPad apps that are missing from the list, including Haiku Deck, Prezi, Popplet, Educreations, Snapguide, Notability, Puppet Pals, Strip Designer, 30hands, Videlcious, and Stick Around. As the co-developer of Stick Around I would love to have my app on Android. Like other developers, we are refining our app on iPad before taking on the time and expense of creating and maintaining an Android version. Of course, there are devices other than iPads and Android tablets. It looks like less than half of the apps in my list are available in the Amazon Appstore for Android. Unfortunately, that means Kindle Fire users will not be able to install many of these apps. Only a few in the list have web-based or Chrome Web Store versions, but you can certainly find similar web-based apps. Do know of great educational apps that have iPad and Android versions? Leave a comment so I can add it to my document.